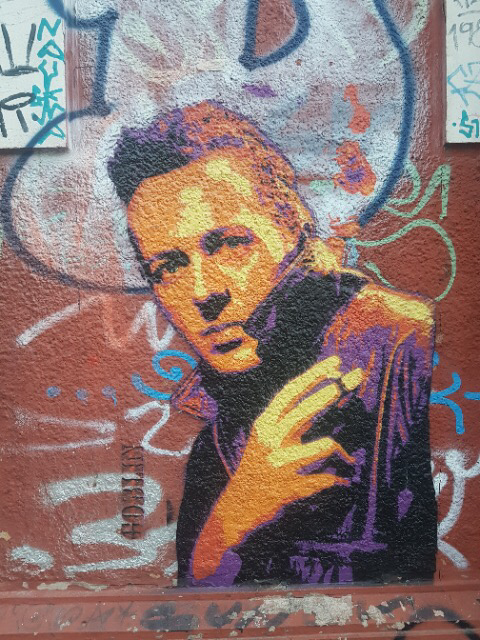 It’s the street art that tops this all off and really makes me feel at home. 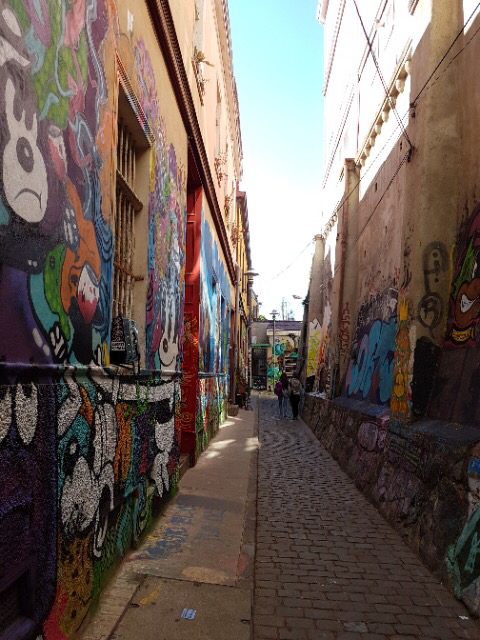 I thought this deserved a separate post all for itself, to share with you some extra pictures from the streets of Valparaíso. Health Warning! 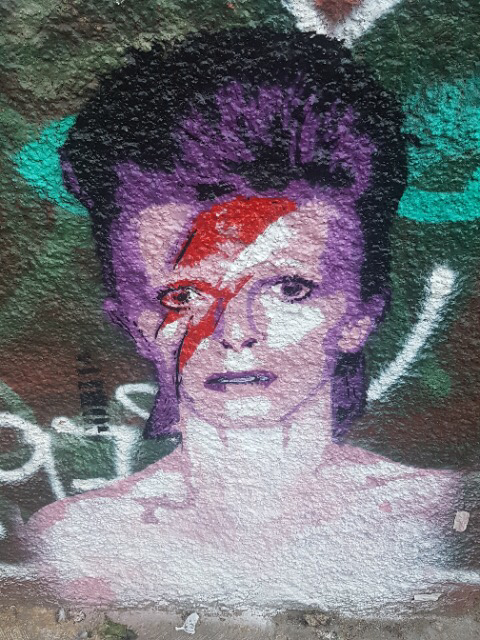 : The descriptions below are the stories I was told whilst on a walking tour of the city. Various theories about the origins of some of the work abound, but I liked the stories I heard so decided to include them here anyway. Have a read and see if you think they’re true or not! 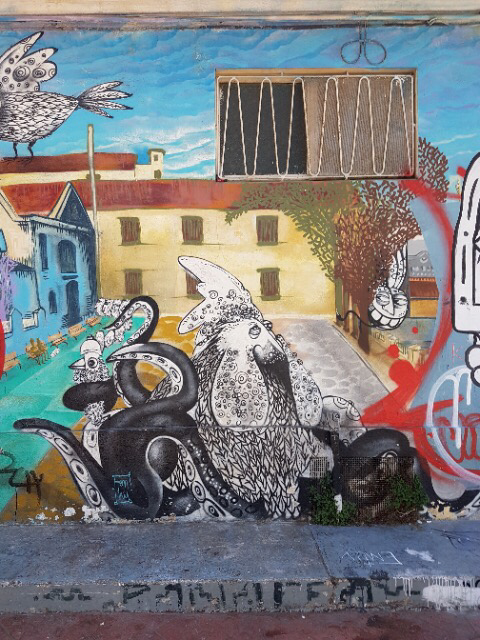 Chilean street artist Millan is from the island of Chiloe, and his works portray themes important to the people there using images of fish. 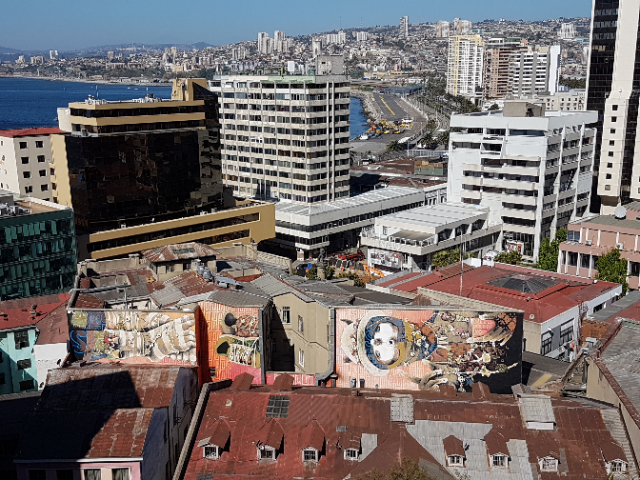 Fishing is a major industry in the area, but as the Chilean government has sold off huge fishing licences to foreign countries, the locals have found it harder and harder to make a living from the remaining reserves left available to them. The title of the piece, ‘Baile Chilote’, refers to the traditional dances of Chiloe. I imagine this title is also meant ironically. The stigmata on the fish represents the sacrifice of the Chiloean people, whose struggle is depicted here by an empty pocket and having to dance with only one boot between them. Millan’s work often includes a wooden church, which is how they are built on the island – I think the eye peering out gives a sense of judgment, whilst the cross falling from the top of the steeple suggests a decline in values. 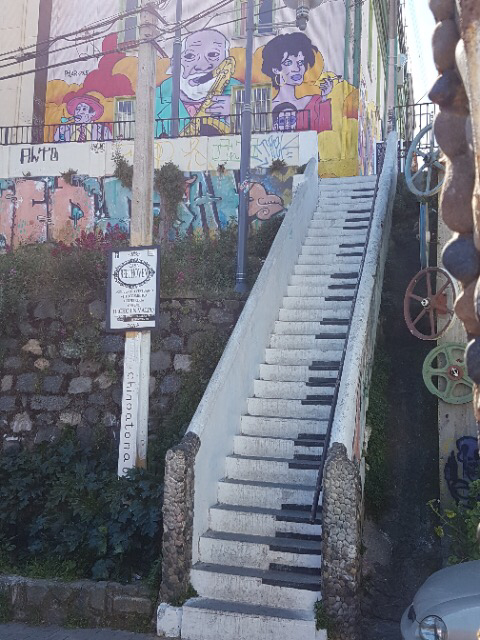 The ‘Piano Stairs’ was apparently painted by a former student of the school located just behind it, to honour the memory of a music teacher after he passed away. 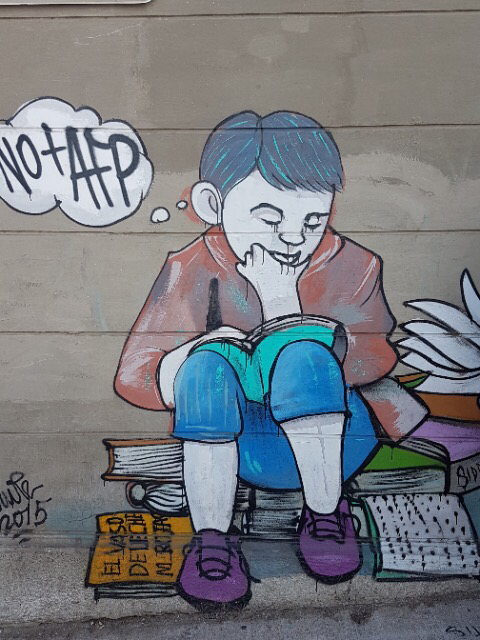 Nearly all state schools in Chile teach a common curriculum, but this teacher taught his music classes out in the street, so that any passers by who also wanted to learn music could join in with his students. The stairs took a while to paint and the graffiti artist got caught, but the police were so touched by the story, they released him and allowed him to go back and finish the job. 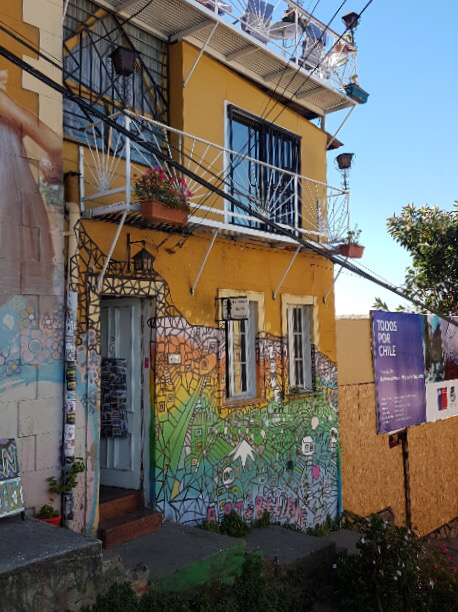 When a young British creative duo (now called ‘Art + Believe’) first moved to this part of Valparaíso on their travels, they were surprised by the negative reception they received from some local residents. 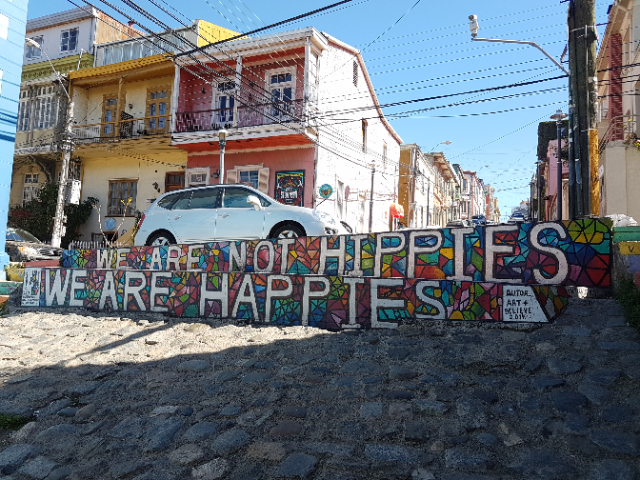 The locals were frustrated at the recent influx of foreign ‘hippies’, who sat around smoking pot all day and didn’t contribute to the community. A kind local man took them in, and had this as a saying. 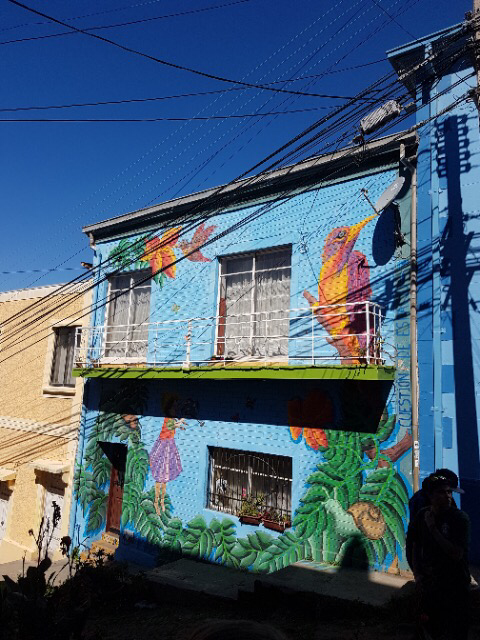 The duo liked it, and wanted to prove others wrong, so drew it on the steps along with the riot of background colours to represent the vibrancy and philosophy of the Chileans. 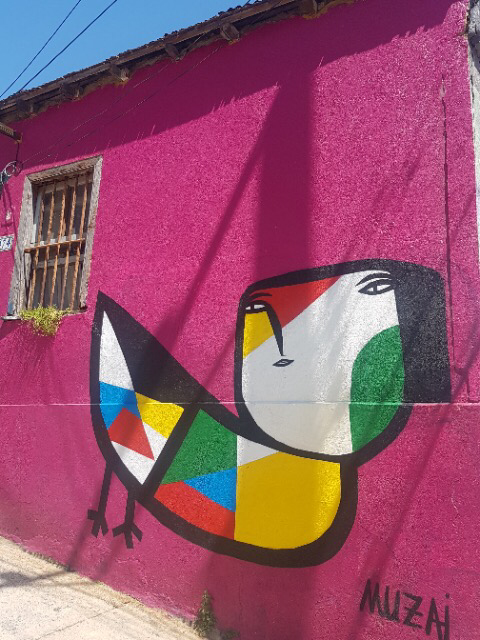 A few years later, the piece was vandalised, but in recognition that they had been wrong about this pair, the local community got together and renovated it themselves. 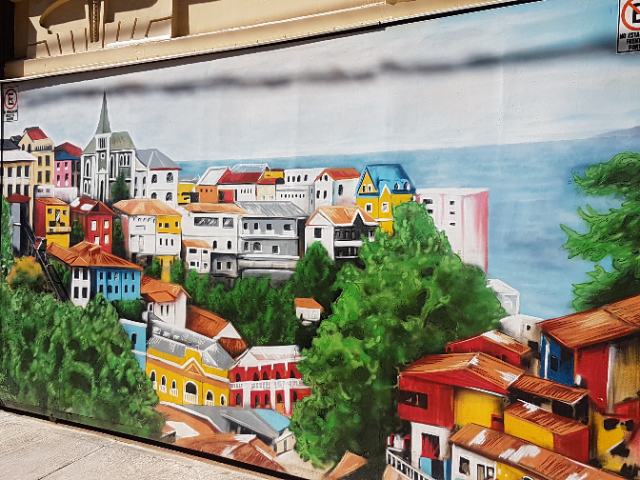 This enormous piece of street art is in 3 parts covering multiple buildings. 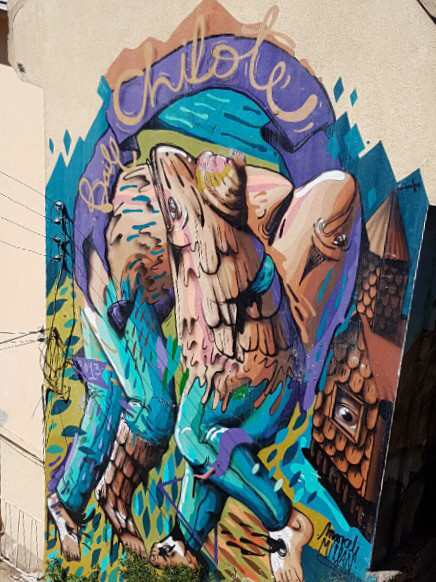 It’s by INTI, a home-grown street artist from Valparaíso, who took his street name from the Incan sun god and the Quechua word for ‘the Sun’. He is now known worldwide. Apparently ‘Kusillo’ is a well known character of the Bolivian altiplano, characterised by making his own clothes with charms and discarded accessories, and stitching them together using threads of many different colours. 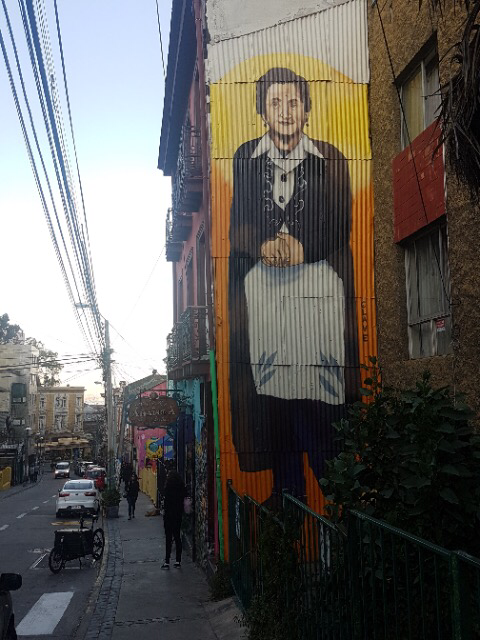 In this piece, INTI has painted the charms strung round Kusillo’s neck as items typical to various South American countries. 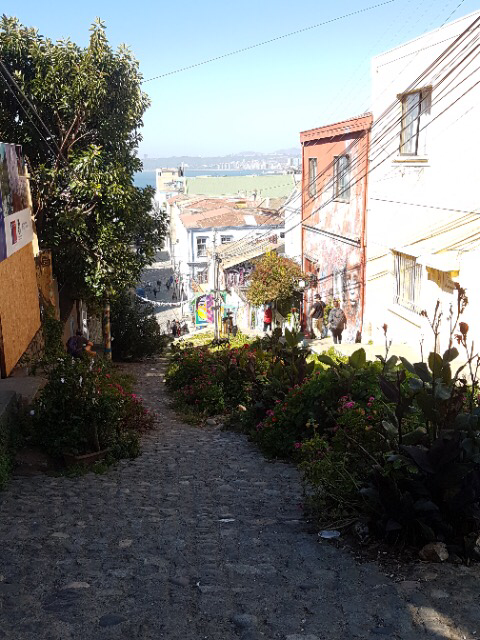 It’s a lot of fun to stand peering from the street above and try to figure out what they all are (I’m sure the Bolivian ñatita skulls I wrote about a few months ago make an appearance). 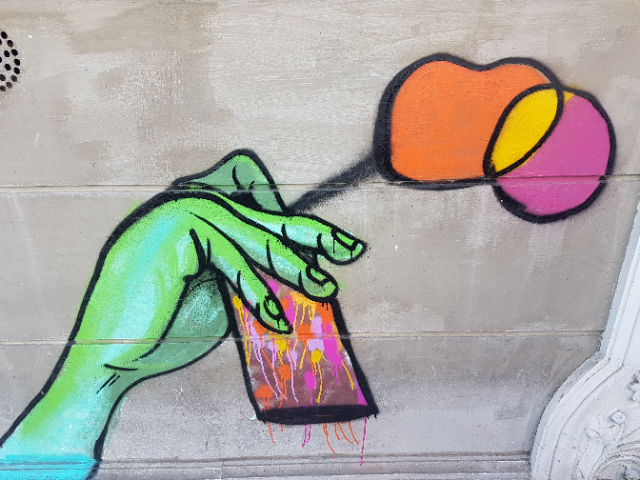 So I think the piece represents a kind of South American unity and also strength in diversity by pulling all these ‘bits and bobs’ together, and also has a political meaning that creative wealth and beauty can come from material poverty. 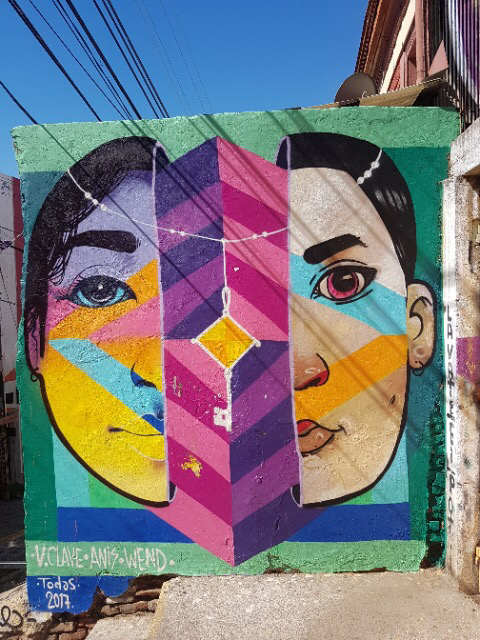 The fact the piece is in 3 parts ‘head over heels’ also suggests to me a bit of the loveable chaos that comes with many major cities in South America. 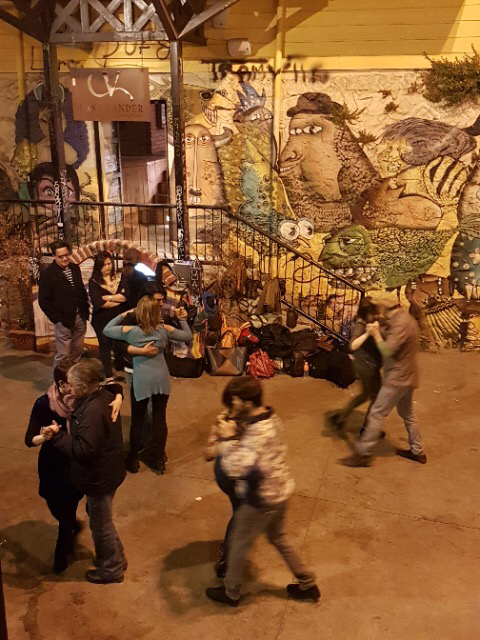 This picture kind of typifies the spirit of Valparaíso for me: people coming together to have fun with music and dancing, with the backdrop of graffiti painted on an old building that contains a funky new restaurant. (You can also go down a slide instead of the steps to get to this courtyard:).